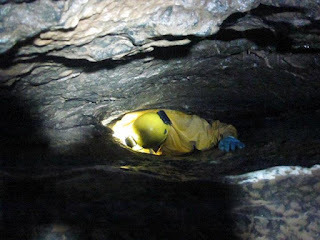 I've been caving for well over twenty years and in all of that time I've had great fun taking the p*** out of the larger members of the caving club when they have been confronted by a confined space, and I've never had to remove clothing to get through a squeeze. In fact I never been put off by the warning, "Not passable by persons of larger than average build." All of the above was of course until I attempted Lesser Garth Cave or as it should more fittingly be called Lesser Girth Cave. 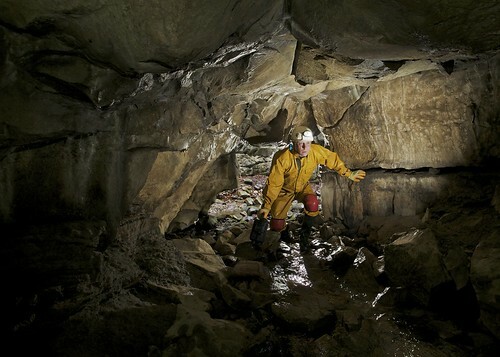 The cave is situated near to the top of a steeply inclined wooded hillside. This would have been potential heart attack scenario anyway, but we had to pick one of the wettest days of the year at the end of the wettest April for 100 years. To add even more to the sporting challenge the slope was covered in a thick layer of sodden wet rotting leaf-mould. 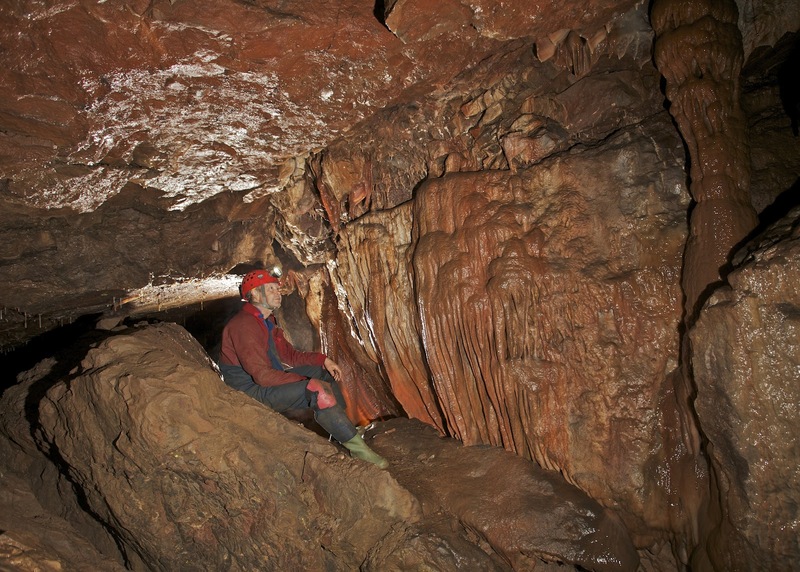 So by the time we got to the cave entrance we already felt like we had done a hard caving trip. Inside the cave a short boulder strewn passage leads to a balcony overlooking the tall Main Chamber. We rigged a rope off natural belays and abseiled down. 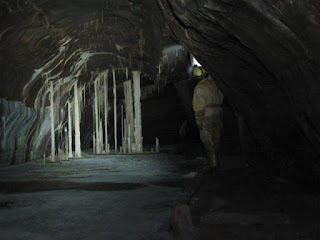 The Main Chamber is an impressive tall passage that has walls covered with fine calcite flows. We followed it for about 200m where it ends in a drafting boulder choke with no clear way on. We also explored a small rift on the right hand wall which proved to be an alternative route to the boulder choke. Brendan then took several photographs as we made our way back to the pitch. On the way out we discovered that it is possible to free climb out of the chamber. Back at the balcony and to the left of the main chamber is a 9m rift. We rigged a rope off 2 dodgy 'P' bolts - the backup bolt does not act as a backup and the single bolt for the main descent has cracks around it! Not liking the look of the bolts, while the other 3 descended the rope, I decided to attempt a free climb down a narrow part of the rift. This didn't go too well as I managed to get myself wedged with my chest jammed and my legs dangling free. Finally I had to have the rope pulled across to me and then had to pendulum out into the passage - putting even more strain on the dodgy hanger! Eventually we all arrived safely at the bottom where the tall rift passage quickly narrows down. The way on is at floor level through a very tight squeeze past a calcite projection. Rachel, the most petite member of the party, tackled this obstacle first and promptly declared it too tight for her to get through. I also failed at the first attempt with my chest jamming tight. Brendan found the same problem, but Richard managed with some grumbling and groaning, and after emptying his chest pocket, to squeeze through. Rachel got through on her second attempt, but Brendan decided at this point that he was never ever going to get to see the rest of the system. I decided to have one further attempt. I unzipped both over-suit and fleece-suit, breathed out as much as possible, held my breath and just managed to get through. With three of us through Brendan rose to the challenge and using the same technique that I had deployed succeeded too, but at the cost of gaining painful ribs and losing some skin off his chest. When we asked him why he hadn't bought his camera box through he said it was because he never expected to get through. Richard was then sent back through to retrieve it. Beyond this squeeze a short section of larger passage leads to a point where a passage on the left leads to a zig zag route to a higher level. Just before the passage appears to end an awkward squeeze upwards, up on the left wall allows entry to 10m of walking passage - a short respite before the next obstacle. 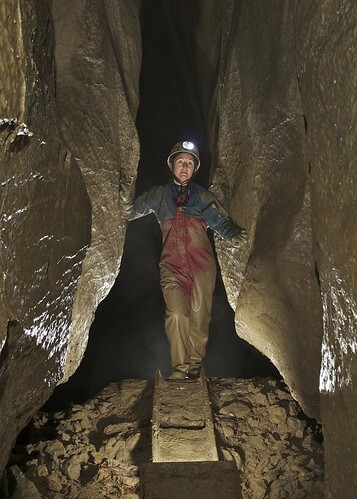 At the end of this section in the floor is a squeeze, which Rachel christened 'the coffin', this leads down into a passage over a calcite flow. This passage closes down ahead, but before it becomes too tight a climb up on the left leads into an alcove with a high level crawl leading off. Following this crawl through a small pool of water leads to yet another obstacle, a squeeze into the top of a calcite walled rift passage. Negotiating this proved interesting both going in, where one ends up trying to wedge oneself into the top of the rift to prevent failing down head first, and also coming back out where fiction holds are the only thing allowing one to gain the height needed to post oneself into the small hole at the top. The way onwards is found high up in the left hand wall where a route can be followed up through boulders leading to Ogof Ffynnon Taf. 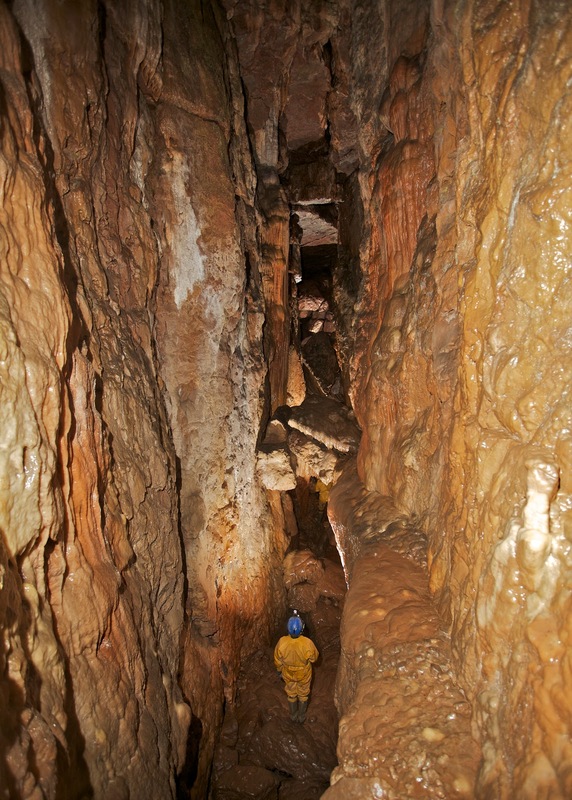 To the right leads to an area of boulders, while to the left the passage quickly increases in size on reaching Oliver's Secret Garden, a large and well decorated passage. 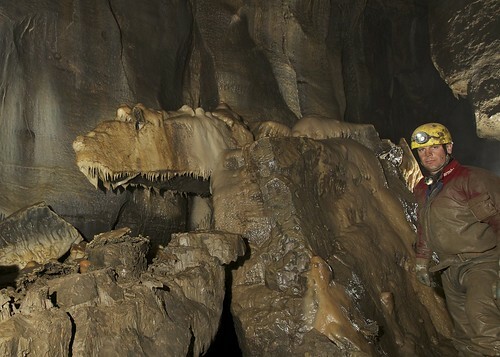 Along most of this passage are seen tree roots descending from the roof and spreading across the calcite formations. 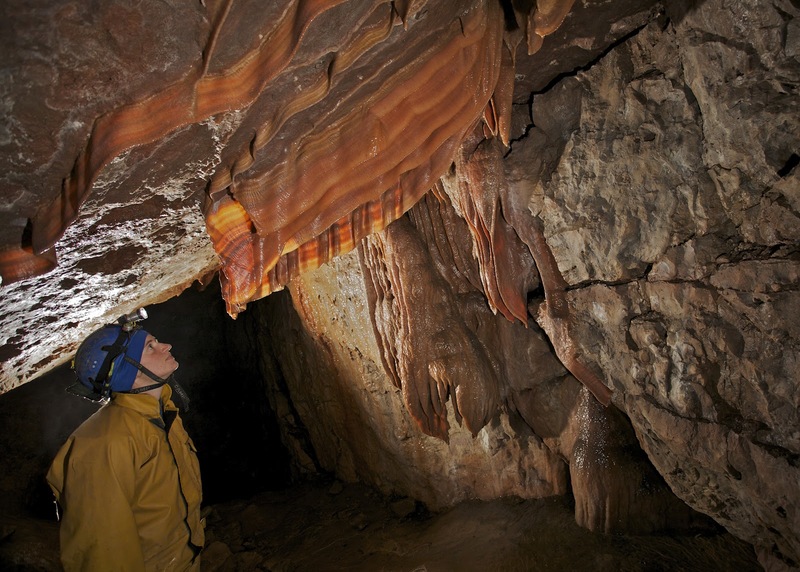 The passage is formed on two levels, the upper level is followed past the tree root covered calcite flowstone and past the 2m tall bright orange Surah's Column to reach a chamber decorated with curtains and straws before ending at a choke. Following the lower route passes some fine formations ending in a grotto with some of the finest curtains seen in any cave in this country. After an hour or so posing for photos all that remained was to tackle to obstacles we encountered on the way in, in the reverse direction. 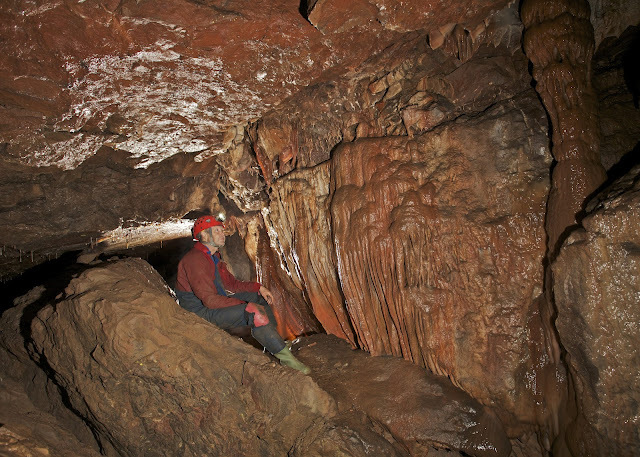 This small cave of less than 400 metres took us five and a half hours which makes it another one in the series, "Remember we do these caves so that you don't have to." Having arranged to meet up with Wal and Chloe at South Wales for half ten on Sunday morning, & as we were camping over the weekend, when my alarm went off I snuggled back in to my duvet hitting the snooze button, ready for another half hour before venturing out of my nice warm bed. Alas this was not to be. Wal began banging on the side of the van at half nine… a full hour early! Dragging myself from the comfort of my toasty bed, in to the drizzling rain, we headed to the hut for a cuppa and a quick breakfast before heading off. Chloe was most impressed with the fact the entrance was virtually on the doorstep, though not as impressed with the climb down the entrance itself. We were soon well on our way. Chloe took the cwm dwr squeeze and crawls in her stride and in no time we were in larger passage making our way down Cwm Dwr Jama and in to the boulder choke. Again this was navigated without issue and we were soon past the Smithy, through Piccadilly and at our objective of Heol Eira where we stopped for some photos. Helping Chloe up and down some of the climbs as we made our way back, Steve amused Chloe with tales of our previous exploits, telling her about a particular time in Giants when I used Steve as a set of steps to climb over some tighter passage and how his back hadn’t been the same since. We were making our way toward main route when I decided it would be a great idea to dive in to a particularly tight and inviting set of boulders to explore. Head first, popping my ribs over the rocks as I dropped in to a small chamber, which didn’t actually go anywhere, I decided the only thing to do was turn around and pop back out. Unfortunately the chamber was just a little too small for me to turn and my helmet wedged with my left leg somewhere around my right ear. Cursing I realised the only way I was going to get out was to reverse, doing a hand stand and try to push up and squeeze through backward. Each time I tried this gravity got the better of me. Steve saw his chance to both assist and get his own back and dived on my exposed legs to stop me slipping back in the hole. Every time I got my hands in position I pushed up, squeezing myself backward and Steve would let off pressure to allow me to move and then pin down my legs to stop me sliding forward. Now I realise I probably left him with more bruises when I used him as a climbing frame, but for a small guy my legs can testify he definitely isn’t light!!! With no further dramas we made our way back to the entrance which Chloe had been dreading. As it happened she needn’t have worried, it turned out her legs are the perfect length for the entrance tube and she had no trouble making her way out. 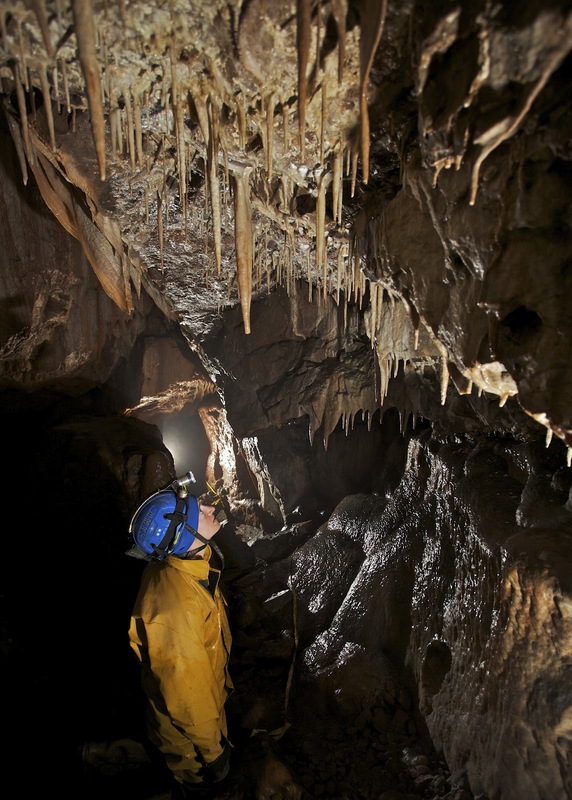 Sunday saw us doing another must in the system with a bank holiday trip to the beautiful Columns. The plan was to follow another group via the short route and then come back through the labyrinth, but Jess spent so long putting on her make up that we missed out on following anyone in. Convinced we knew which way to go, we managed to explore every passage off big chamber before recognising the right route to Cairn Chamber. Here we began up a wet calcite passage and soon heard voices ahead. The columns are magnificent and Keith had also mentioned not to miss the unusual mud stalagmites topped with pebbles at the entrance which again were something we had never seen before. After a few photographs we made our way down the labyrinth and through to the base of Arete Chamber, down through the boulders and out via Salubrious. At the top of the corkscrew boulder choke I wanted to find the other routes to Arete. After spotting the climb up for the mid-section, we went off to find the top route. There we found a group of Belgians who thought they were making their way out, but were actually about to make their way across the top of Arete chamber & quite possibly down to the bottom of Arete chamber and squished like a bun, so we decided to lead them back out and save exploring further for another day.